Why are strawberries red, you ask--learn the answer here. The chemicals that make strawberries red are called "anthocyanins". They are made in plants by the combining of a molecule of some type of sugar with a molecule of an "anthocyanidin". Even though the anthocyanins are brightly colored, their anthocyanidin precursors are colorless, and it's only when these precursors join with sugar that bright colors appear. This is why strawberries (and other fruits) become so very colorful only during their ripening process, at which time sugars become concentrated in the fruit. (by clicking the preceding link, the link will open in a new window). Interestingly, anthocyanins are not always red. In fact, they can be purple (e.g. concord grapes), or even blue (e.g. blueberries). Beyond fruits, they are also responsible for most of these same colors in flower petals, tree leaves and other plant parts ("anthocyanin" comes from two Greek words which mean "blue flower"). The differences in color are caused by differences in the pH (that is, the acidity/alkalinity) of the plant tissues. Since strawberries are somewhat acidic, their anthocyanins reflect red light (the acid in strawberries gives them their sourness), whereas the more alkaline fruit of blueberries causes their anthocyanins to reflect blue light (the alkalinity of a blueberry's skin is what makes it slightly bitter tasting). These effects of pH on anthocyanins are also what cause the color changes in litmus paper during a chemical "litmus test". Much research has been conducted in regards to the antioxidant properties of anthocyanins. In vitro (that is, under laboratory conditions outside of the body), anthocyanins are very powerful absorbers of the single, ionized oxygen atoms commonly referred to as "free radicals". It is therefore speculated that these same anthocyanins may have similarly strong antioxidant capabilities in vivo (that is, inside the body). If so, eating brightly-colored foods might be very helpful in preventing many chronic illnesses caused by free radical damage, particularly cancer. This is in some doubt, however, due to the fact that only a small fraction of the anthocyanins that people eat is ever absorbed into the bloodstream, and even that amount tends to be eliminated fairly quickly by the body (perhaps too quickly to be effective). 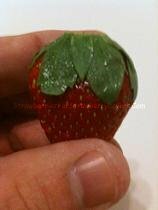 here on this site and read about the "Sofar" variety of strawberry.